Such a thoughtful gift to give to family and friends to remember your very special celebration. 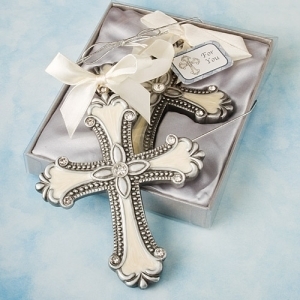 Our 4 1/4" long x 3 1/2" cross ornaments are made of a silver pewter colored poly resin with a detailed ivory inlaid enamel design. It is then accented with glistening rhinestones at its tips for a dramatic effect. Each cross ornament favor has an ivory satin ribbon tied at its top for easy and stylish hanging. Another lovely feature of this gift is that it arrives attractively packaged in a silver gift box that features a clear showcase top. Each cross favor is nestled in silver satin inside. The box is then finished with a silver metallic elastic cord and comes with an attached cross design "For You" tag. Please allow up to 5 business days to fulfill your order, than add shipping time.